Films with Christian themes and films with Asian American lead actors are beginning to make a major impact on the cinematic landscape. But a film merging both of these worlds is fairly unchartered territory. Enter “Purity,” a debut feature film by Narhee Ahn that explores themes of love, relationships and tragedy through the eyes of Korean American Christians in the suburbs. Grace Kim, the daughter of a prominent pastor, confines herself to her house in order to cope with the death of her mother. The 19-year-old seminary student – played by Susane E. Lee – replaces her quest for purity amidst temptation by a boy whom no one thinks is right for her (Matt Kim, played by Derek Mio) with the quest of purifying her confined environment in the wake of her loss. Grace obsessively scrubs and cleans, and cooks elaborate meals for her bewildered father (Chil Kong), who must come to terms with his grief himself. From a personal perspective as a Chinese American Christian, the synopsis is promising and intriguing. 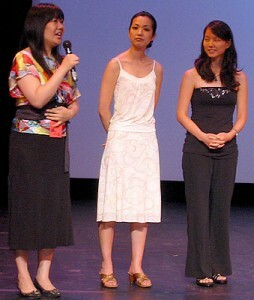 Ahn herself drew from her roots when making the film. Unfortunately, while the film has its moments, the story falls flat due to the overuse of music, washed-out cinematography and a lack of chemistry between most of the actors. Some of the dialogue feels forced or recited instead of heartfelt and sincere. It’s a shame because beneath the music video of wooden conversations and blurred images, Ahn has penned a solid screenplay. Her inclusion of the awkward dynamics within an Asian American youth fellowship group, for example, is spot on. However, by the time that high drama suddenly intervenes, it is too late to save the story. That said, Kong delivers a brilliant, understated performance as Reverend Kim, Grace’s father. He shows a range of emotions in having to simultaneously cope with the loss of his wife, the struggle to continue to be a pillar of faith for a congregation in the aftermath of the tragedy and the question of how to raise Grace on his own. Leonard Wu does a nice job in his role as Jonah Park, the all-too eager to please youth minister who approaches his job by the textbook (“I have a lot of experience doing tragedy,” he eagerly advises Reverend Kim on how to deal with Grace) but is at a literal loss for words when it comes to matters of the heart. And it is these same matters of the heart that “Purity,” on the whole, struggles to project. One wonders if the emotional disconnect – particularly when it comes to the relationships between Grace, Matt, Jonah and Grace’s best friend Naomi (Jae W. Suh) – would have been avoided with a stronger delivery. Hopefully, “Purity” will provide a catalyst for other films to explore the Asian American Christian young adult experience.